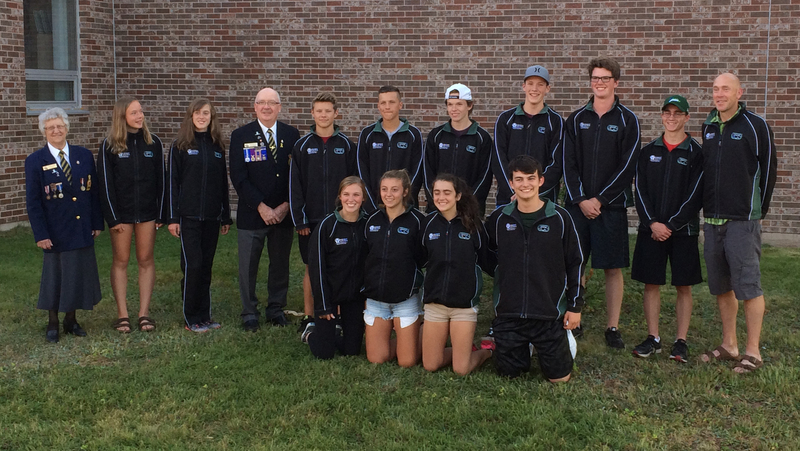 Team PEI should be very proud of their accomplishments at this year’s Legion Track and Field championships, as they were impressive on the track and on the field, and were outstanding representatives of the province and PEI Legion Command at all times. On the track, sprinters Zach Wilson, Owen MacFadyen, Hillary MacLean and Morgan Cormier turned in very solid results in the 100m and 200m races, finishing strong in their heats against the top U18s in the country. Also on the track, Sophie Peterson held her own against the top mid-distance runners in U16, posting personal bests in the 800m, 1200m and 200m. Joel Gallant also turned in gutsy performances in both the 800m and 2000m, proving he was deserving of his high ranking entering the competition. His brother, Luc Gallant, was a real bright spot for Team PEI, turning in a fantastic 9:10 in the 3000m, a substantial PB, and following up with a solid steeplechase performance a day later. In the field events, jumper Tori Hogan had some technically strong jumps in both long and triple jump. Thomas Docherty and Thomas Yeo both proved that they are up and coming national caliber athletes. Docherty reaching the top eight in both javelin and high jump, and Yeo doing the same in shot put and discus. This is especially impressive considering this was the first Legions for both boys. Rounding out the Evangeline Region trio with the Gallant brothers, Maria Arsenault matched her personal best of 1.45 m in the high jump, narrowly missing at 1.50m. Finally, Malcolm Gilman turned in one of the truly inspiring performances of the meet, making the finals and finishing 6th in an extremely strong javelin field with a PB of 54.24m into a headwind. As coach, I am extremely proud of all of the athletes who travelled to Brandon. It was truly inspiring watching everyone compete, and I know every single person in a PEI singlet gave their best effort in each and every event. Perhaps more importantly, this group should be very proud of the way they carried themselves the entire time, as they were a pleasure to coach. Special congratulations to Morgan, Owen, Tori, Luc and Malcolm on outstanding Legion careers. Their experience and leadership was greatly appreciated. Well done, everyone.